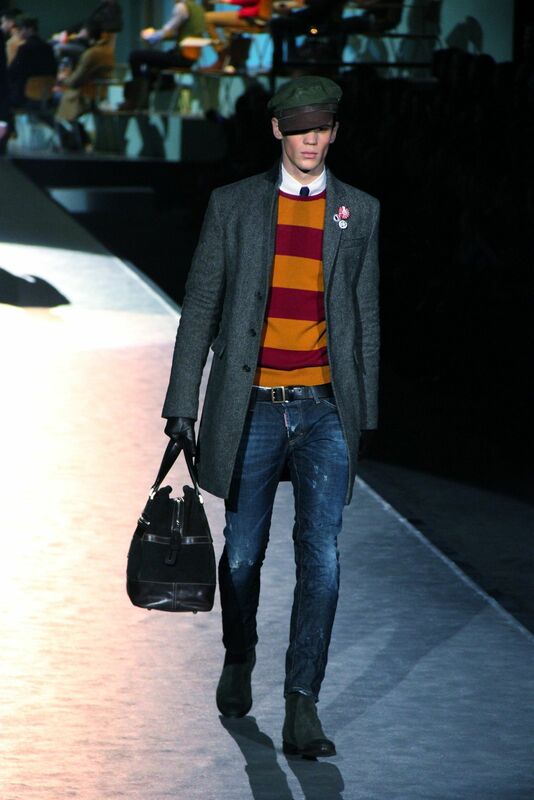 The FW 2012/13 Dsquared² collection is inspired by University students and in particular by one special kind of student: GOOD FAMILY, BAD REPUTATION! 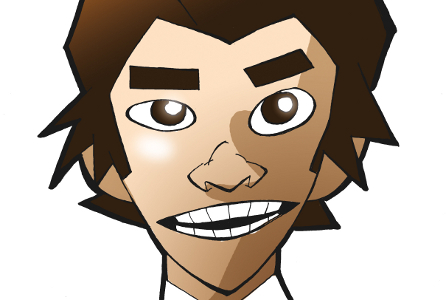 Radical chic party boys from high society, foul-mouthed bourgeois students who work real hard on having a good time. Boys who spend more time on their clothes than on books but that is no big deal since they will graduate no matter what. 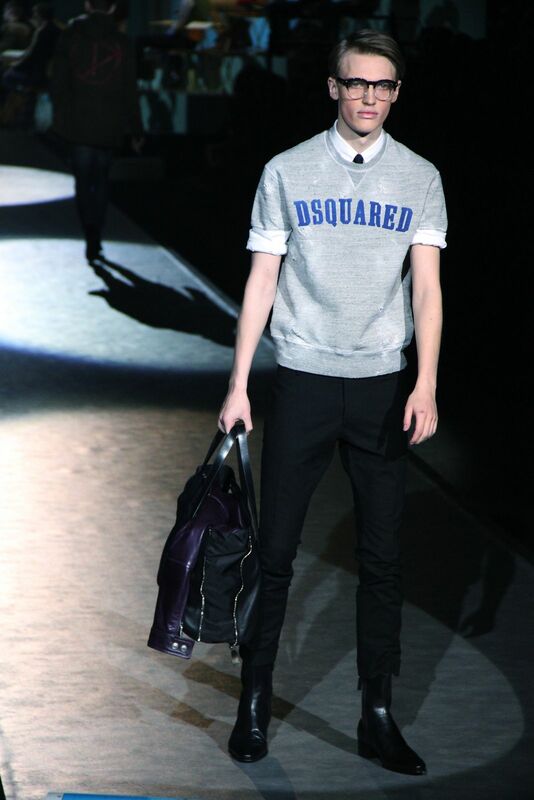 The Dsquared² boy certainly doesn’t excel at school but he is definitely the coolest one on campus. This time around, the silhouette is the novelty. Very low-waist slim cut trousers that create a “bottle silhouette”: very tight pants, tighter than ever, fitted around the knee and slightly wider at the bottom are paired with short, tight jackets. Classic pieces are customized with markers, and a variety of studs (stars, labels, maple leafs,..) randomly found from old Dsquared² jackets, reused to personalize garments. Boobou jackets in oiled fabric or suede with large pockets that always come in handy. Accessories: “woody” eyewear glasses in transparent plastic and wood for the “perfect” student; without forgetting fun sunglasses to hide dark circles after a wild on-campus party. 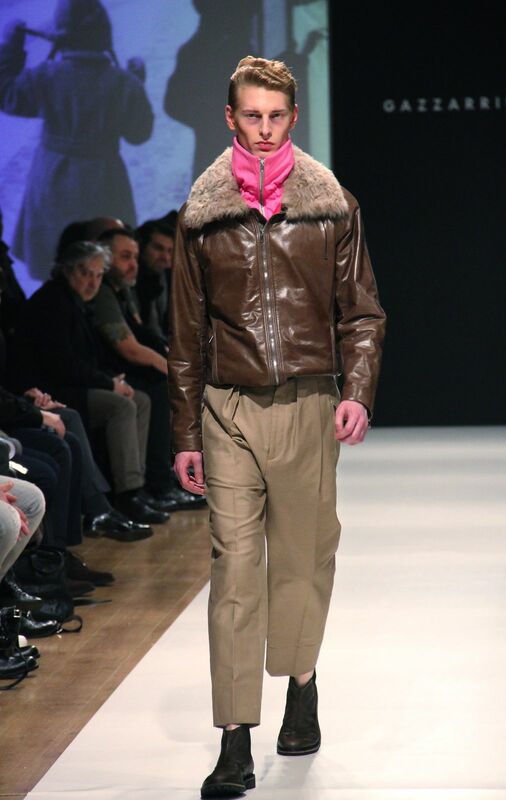 Scarves, gloves and a military beret with a leather visor. Vintage-like suede pointed or round tip ankle boots, in brown or grey, in leather or patent leather. 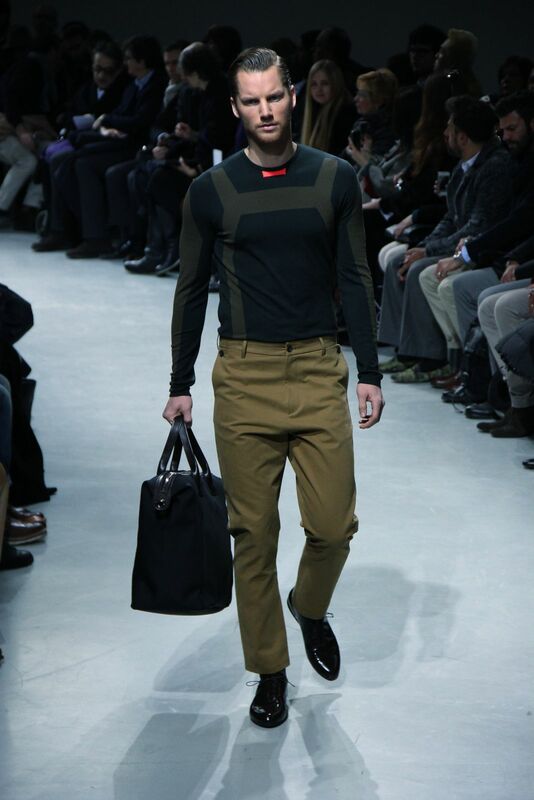 The colour palette: beige, camel, military green, denim blue, grey, black with glimpses of red and white. 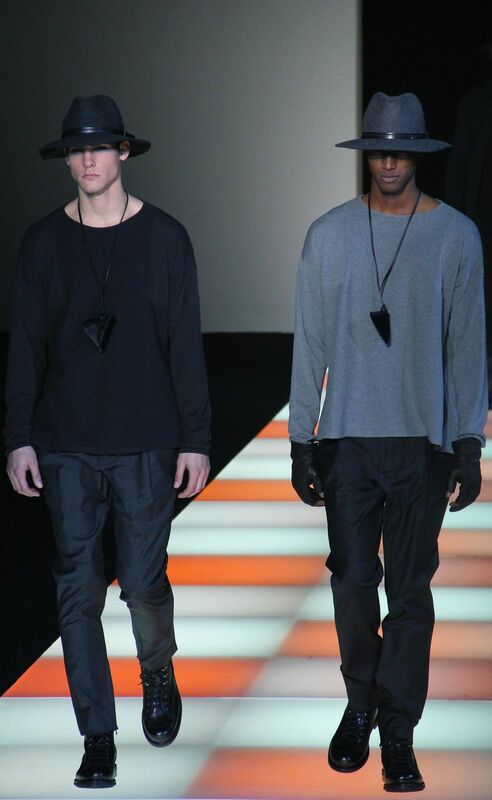 A collection that could be defined as being all about the interior world of the wearer. The austere expression of deep, conceptual sentiments, revealing the essence of a style that is pure to its very roots. Having surpassed the synthetic brilliance of nylon and the ease of sportswear, only the compact opaqueness of wool remains. The depths of black, ebony-brown, anthracite and smoke-grey are occasionally emphasized by an unexpected contrasting white cloth lining. 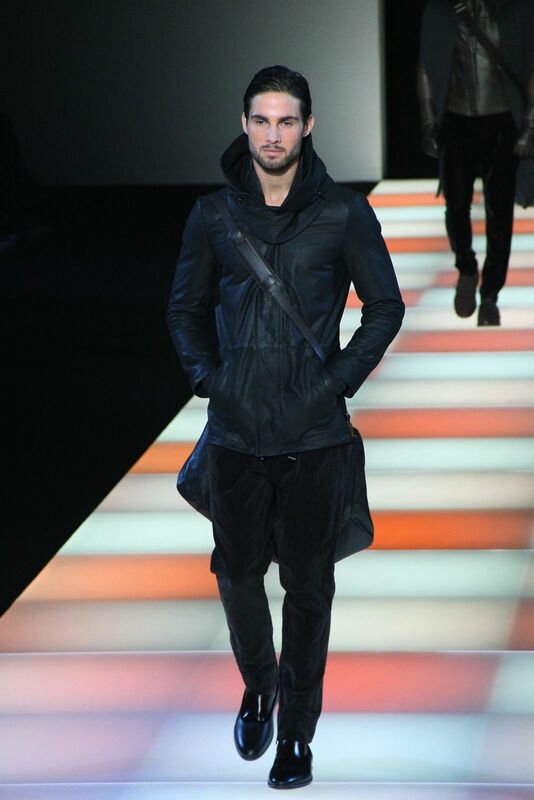 The duffle coat is back, this time with Emporio Armani proportions (the length is 125cm). 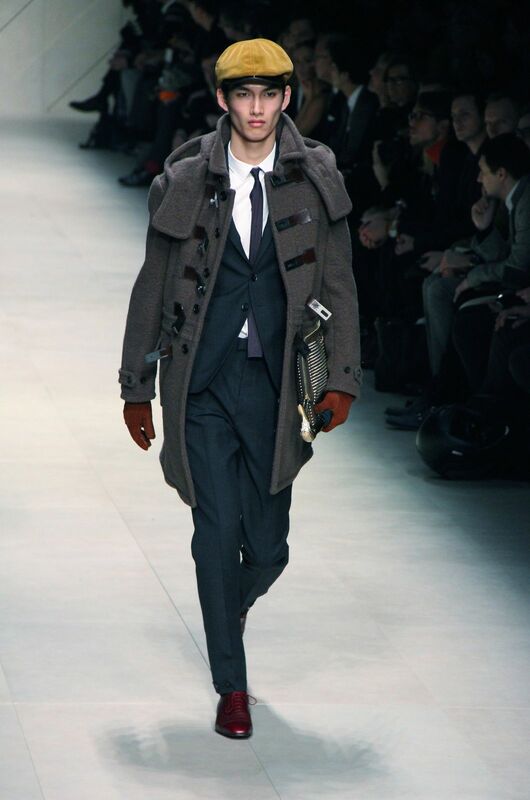 Pea coats in triple-overlapping cloth have a generous shape, while the deconstructed jackets are more long-line. The shirts show an extraordinary attention to detail, with a touch of flannel, or other contrasting cloth, at the neck and wrists. Softest sheepskin and magnificent double leather make up generous garments with a hidden double- breasted closure. The unusual tone-on-tone digital print suggests the veining of a tree trunk, adding imperceptible vibrations of colour to dark velvets. 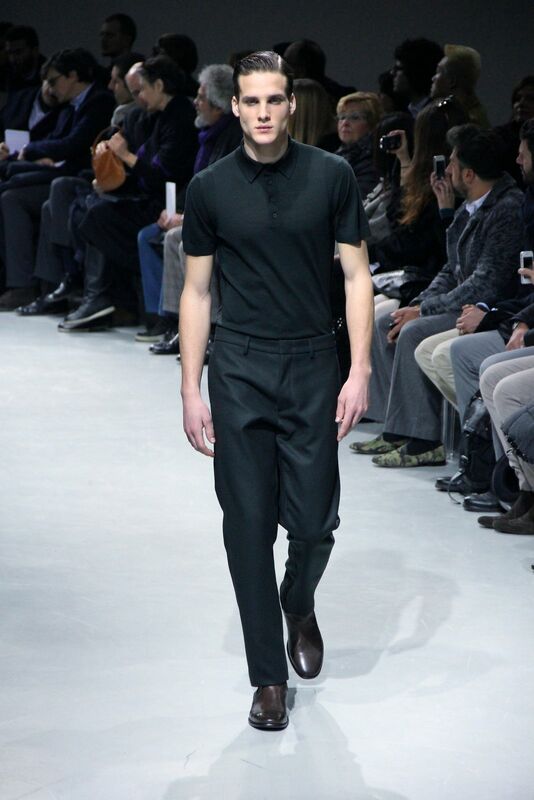 A collection of essential colours and garments, reflecting a discipline of thought and conduct. 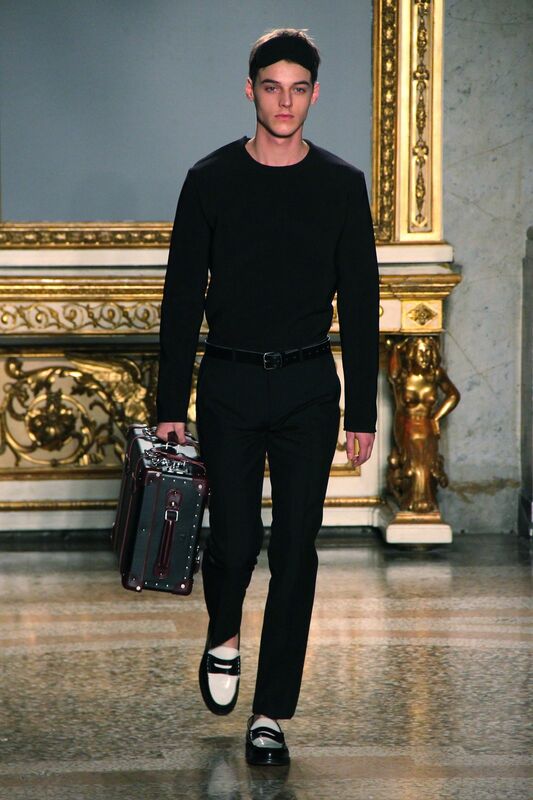 The severity is accentuated by the clean lines of the bags, briefcases and striking, large, rigid berets. 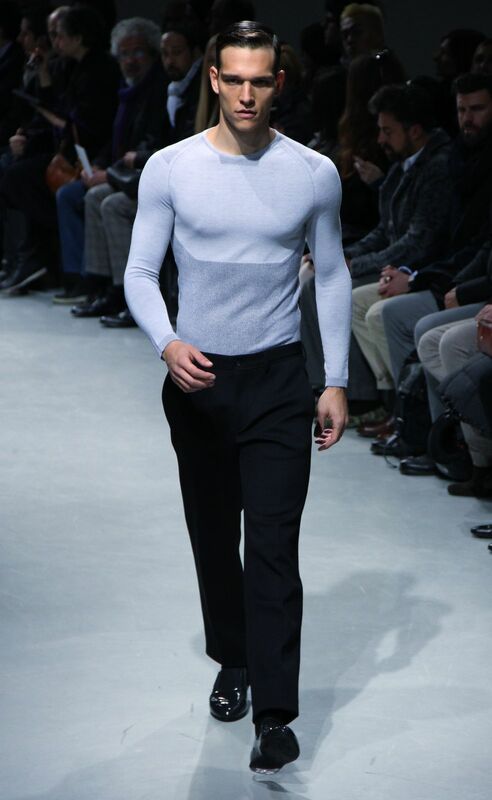 The Dirk Bikkembergs man of winter 2012/13 lives in a future where simplicity is the strong point of his wardrobe. In this collection there is a constant striving towards reinterpreting the style of the fashion house, which is visible in the meticulous study of the shape, the painstaking research on details and the physical presence, which is emphasized but never overexposed. 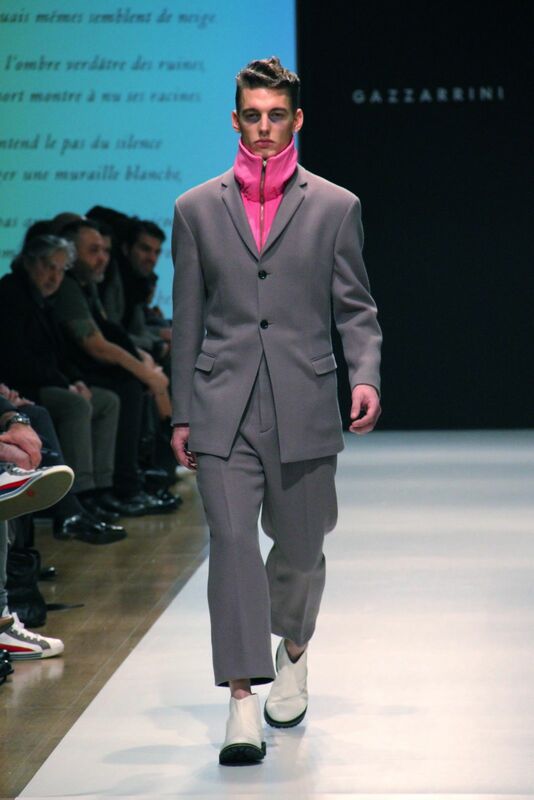 On the catwalk, the men carry with them the historical DNA of the brand, with an all-round contemporary awareness: the perfection of the sportsman coincides with the conceptual balance of good looks. On show, jerkins and coatswhere whose impeccable craftsmanship is seen not only from the lining, but is revealed by exposed outer zips and by the contrasting thread that outlines the skeleton. Thus, the structure of the garment becomes the basis for discreet graphic elements of deconstructed jackets, reefer jackets with a linear cut and reworked windbreakers. Effects of multiple materials and warm/cold contrasts run through the whole collection: the softness of cashmere is combined with the stiffness of technical fabrics, fine leathers and rich wools. On the other hand, there is a certain linearity in the colours: (non) blacks, very dark greens and blues, smoky greens. Nuances to mix and layer, a chromatic certainty pondered thoroughly. 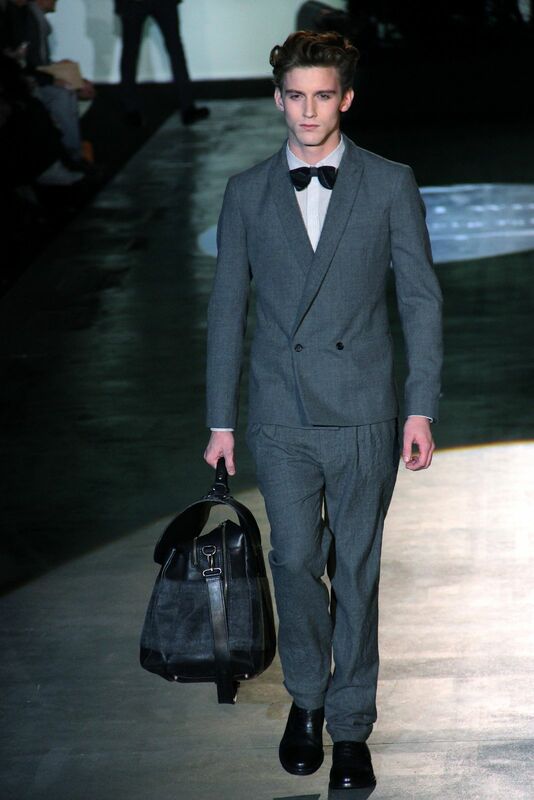 Also, a reference to casual rigorousness, with vaguely retro shapes reinterpreted through a metropolitan style, such as the gabardine trench coats and jerkins with severe lines, double zips and inner pockets concealed between two layers: a perfect balance between a formal and refined external look and a sporty mood on the inside. The trousers follow a fairly soft line and are often cut like jeans. They are hybrid as well, with a slightly lowered crotch and in some cases a more regular fit. 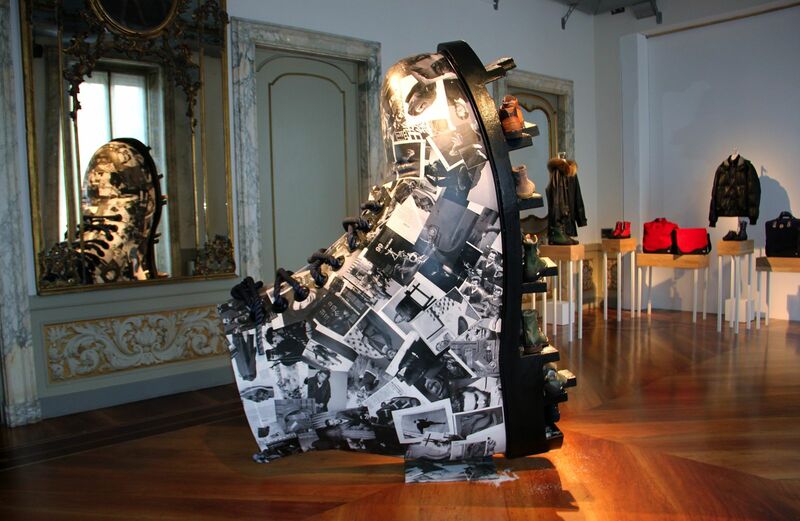 A new interpretation of the fit is also visible in the volumes, which are always very balanced. 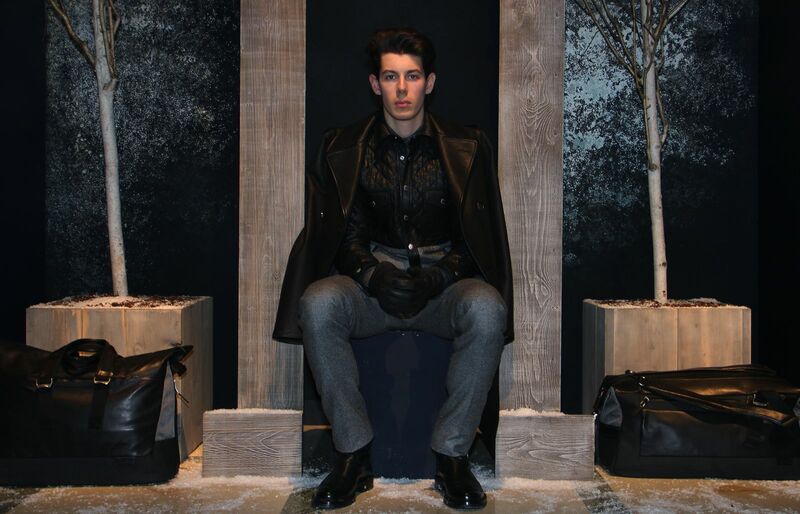 In addition, leather jerkins and modern suits of armour enhanced by the brand’s favourite details: maxi-pockets, large zips and exposed woollen inserts. 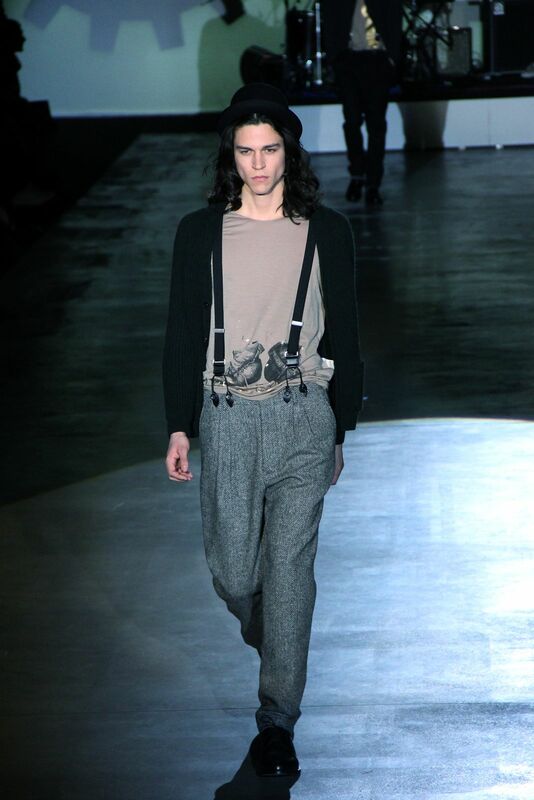 For knitwear, oblique effects, thick cables and beautiful graphic motifs created by exposed seams. 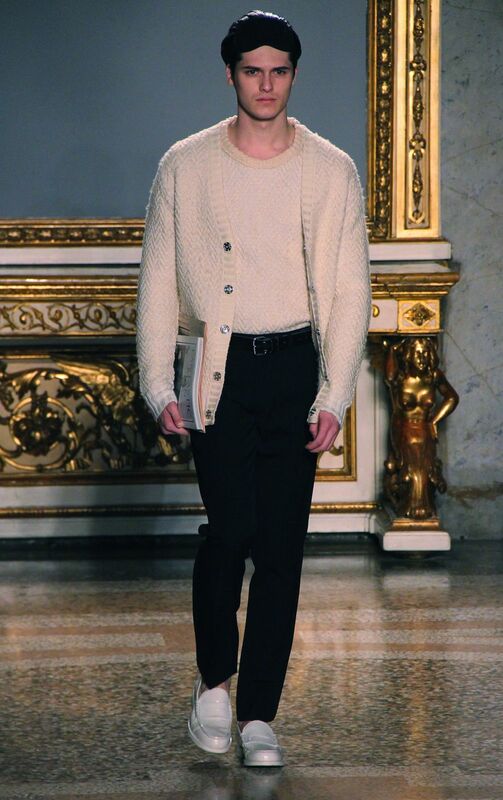 Wool and nylon technical cardigans and seamless cashmere crewnecks. 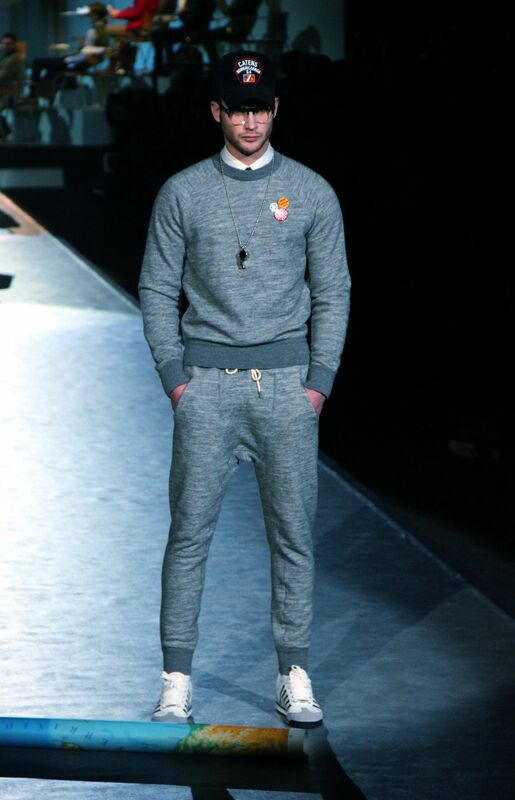 Even the classic model of the sweatshirt is offered in cashmere: the absolute conjunction of elegance and casual comfort. The evening is opulent: beaver furs, sweaters worn on the skin in gold and violet lurex. 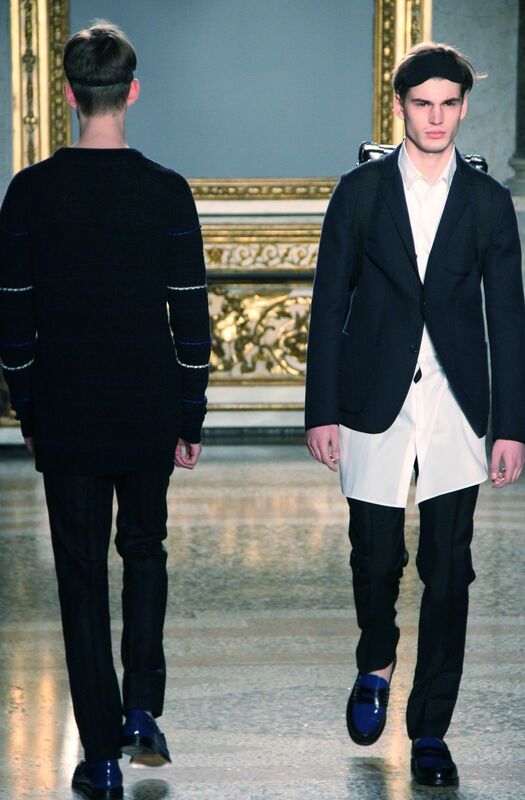 Tuxedos, hints of velvet, cotton and technical fabric sweaters enhanced by leather inserts. As far as accessories go, leather tote and weekend bags are offered in the most classic sizes, in shades that go from black to mud, via a very dark green. The wool hats take the classic baseball and riding caps as inspiration. Iceberg invents a colorful slant on Modern Times, the black&white film that Charlie Chaplin directed and starred in. Craftsmanship, pure manual and technical prowess find expression in an up-to-date collection with traditional British flair where hand knits meet classic prince of wales, houndstooth check and other favorite men’s fabrics. Heavy melton is reworked and pressed with leather, needlepunched with nylon to set the bases for a totally today tech style. Cottons and cashmeres come in a palette of indigo blue, wine red, green and beige hues. Touches of gold and silver add a contemporary glam allure. 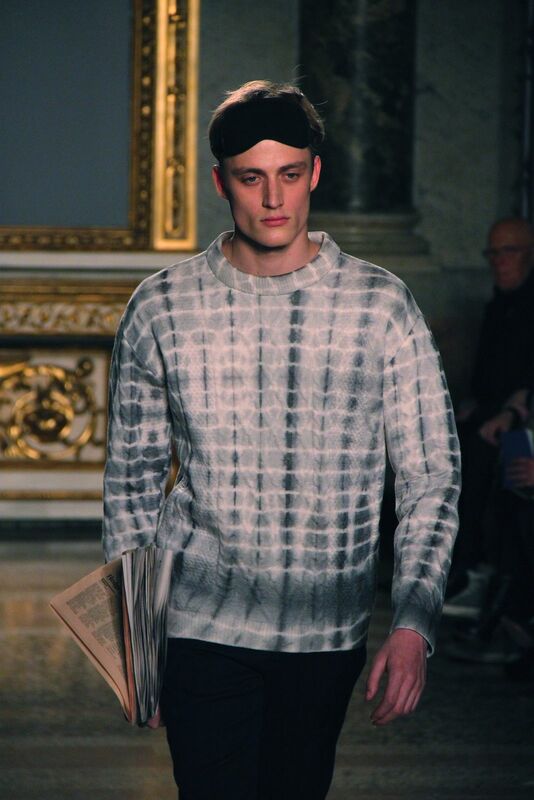 NICOLE FARHI celebrates its 30th Anniversary in 2012 with a menswear collection ideal for the modern world traveler doing his own urban Grand Tour for the 21st Century. 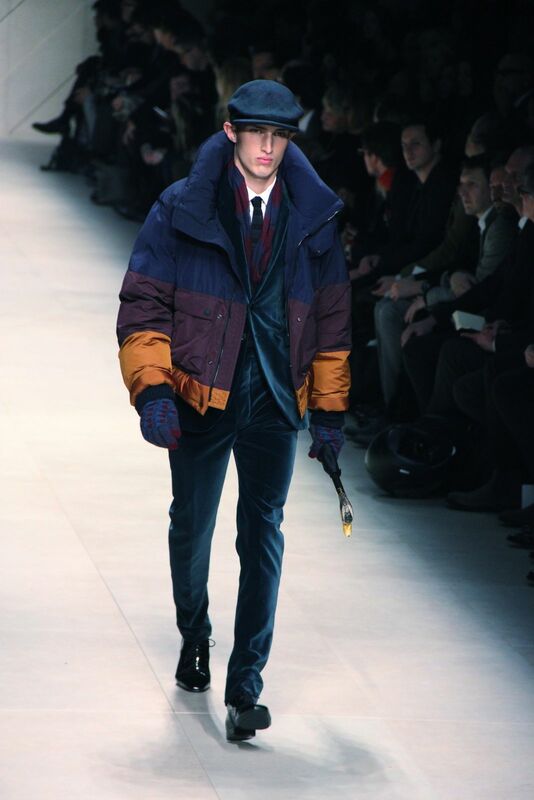 The look is layered, adaptable and functional for journeys that encompass colder northern cities and tropical climates. The NICOLE FARHI men’s collection is one of unexpected combinations inspired by traditional and modern techniques from around the world. A Scandinavian sweater is knitted in a way that is very similar to kilim making while a traditional Aran jumper is reworked with tye dye and a jersey t-shirt boasts pop Hawaiian prints. A classic over coat is realized using the Indian Kantha quilting technique. An original William Morris artwork sourced from the Liberty archives is needle punched into flannel jackets or cut into strips and knitted into sweaters. The color palette is strong with china blue and oxblood sitting alongside cream, off white, charcoal, slate and black. 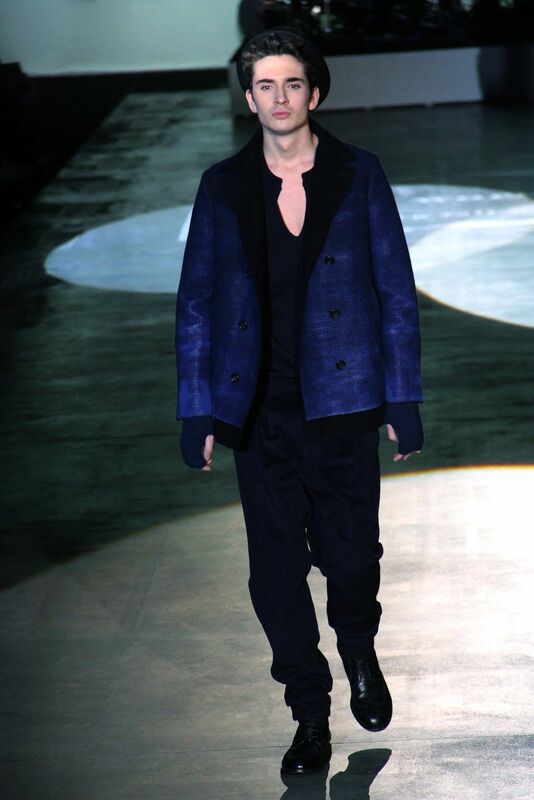 The raincoats, parkas and overcoats are worn over pyjama style long sleeved tops, a feather light cardigan sits snugly under a china blue wool hooded overcoat. A modern smoking jacket in the customized Liberty print is worn with narrow trousers and loafers, the perfect footwear for the frequent flyer. For this travel inspired collection NICOLE FARHI has collaborated with British luggage maker Globe Trotter to create a travel case made from vulcanized fiber board, a technique developed in the late 19th Century, transforming this classic piece into a rucksack for the smart and resourceful traveler. A travel that starts from the tradition, that retraces know streets, even if renewed. The inspiration born here: from elements and characteristics that recall Bruges. Its colours, its romantic and gloomy atmospheres. White of the swans, red of bricks, the geometry of constructions, architectures. A direct reference to the old tradition, to the hand-craft taste, that makes each production exciting. 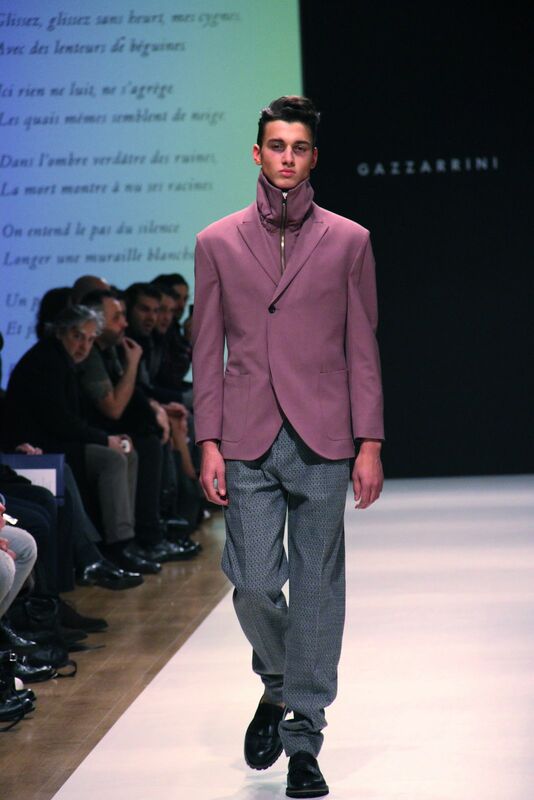 It is the tailoring effect: that characterizes Gazzarrini as ‘ Maison Industrielle ‘ , it begins from the building’s architectural, roofs, bridges and it reaches the creation of the cloth; heraldic depiction and laces woof are read in a modern view. Each part of the romantic iconography gets appearance of the style pattern. Tradition and very warm works and felts are mixed with angora or cashmere declined in a endless shadow of greys, greens, until mud-colour creating games of depth and intensity. Structured nylons or coloured sheepskin insets tell a story that is an ensemble of cultures and traditions: unique way of interpreting the present. Games of prices offer a tridimentional silhouette. Heraldy and aristocratic traditional nuances create shirts in delicate colours: green, grey and camel which cope with yellow and active rose high-neck mohair that can be worn with a jacket. Flannels and gaberdine are revised in shape and perfomant volume and underline the urban technicality of trousers: a sport concept applied to the elegance where the must is represented by thin elastic cotton. 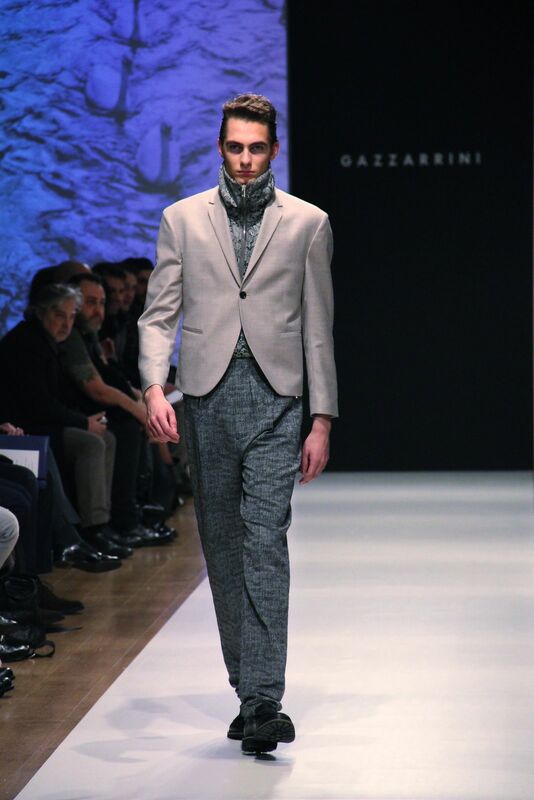 Gazzarrini wants to travel the stree of ” contemporary tailoring ” with its own connotations. Carefully cuts, that look after the tridimensionality of the figure. The elegance that springs from the balance of lines that melt in a sinuous movement. 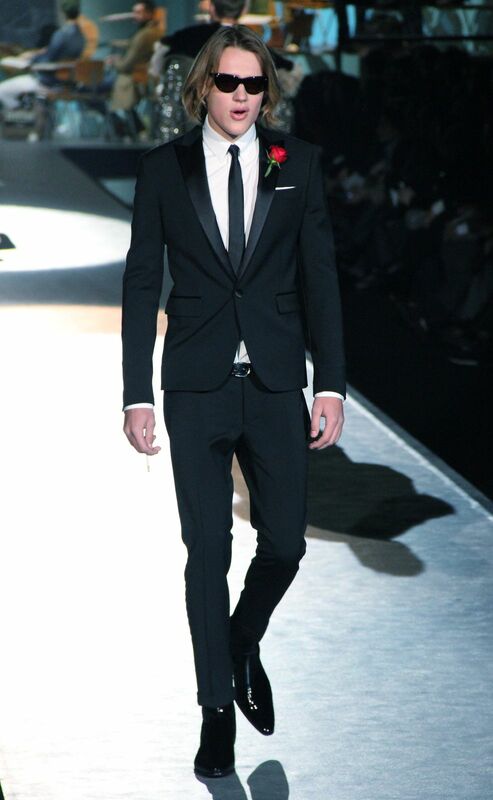 The formal is deconstructed and the informal becomes elegance. 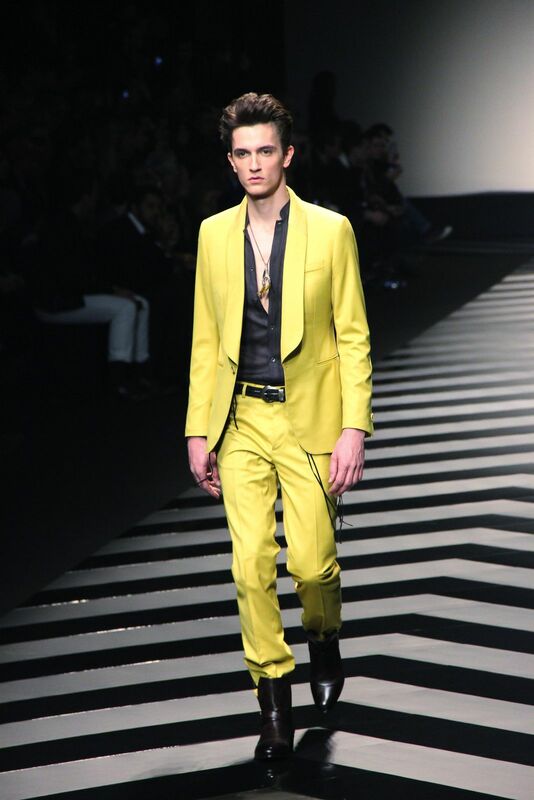 Ermanno Scervino brings us the Rock Royal style for next winter. 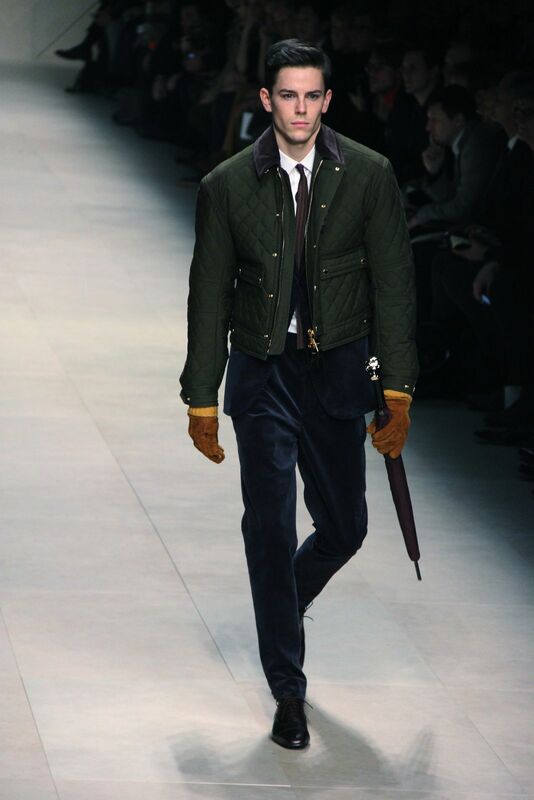 Modern Italian sartorial craftsmanship meets English inspiration. 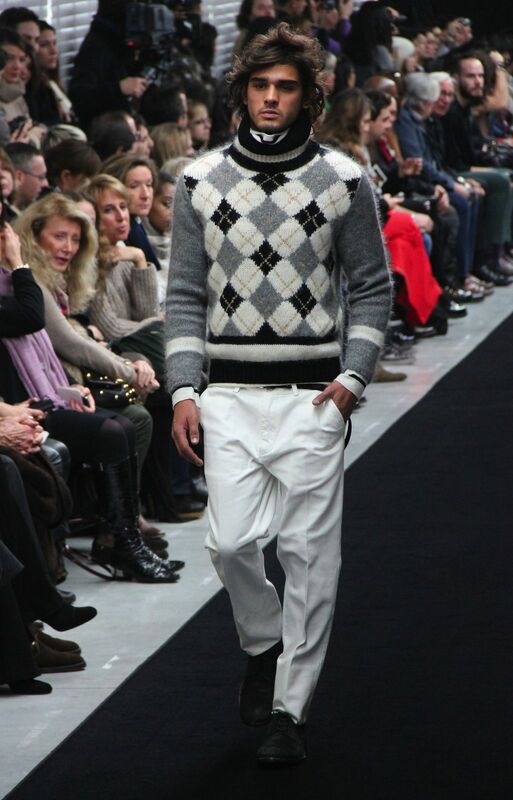 Argyle knitwear and stripes under tailored garments. 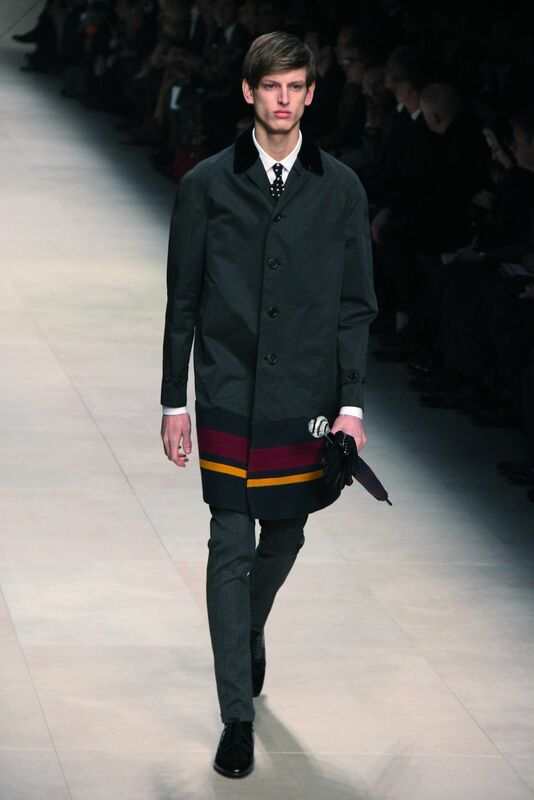 The House’s exclusive fabrics and the stretch boiled wool are the centerpieces of fitted yet soft jackets and overcoats. Experimentation of new comfortable knit fabrics doubled with plain knit. The check prints -from Prince of Wales to micro and maxi houndstooth– blend together pairing perfectly on coats, jackets and scarves. 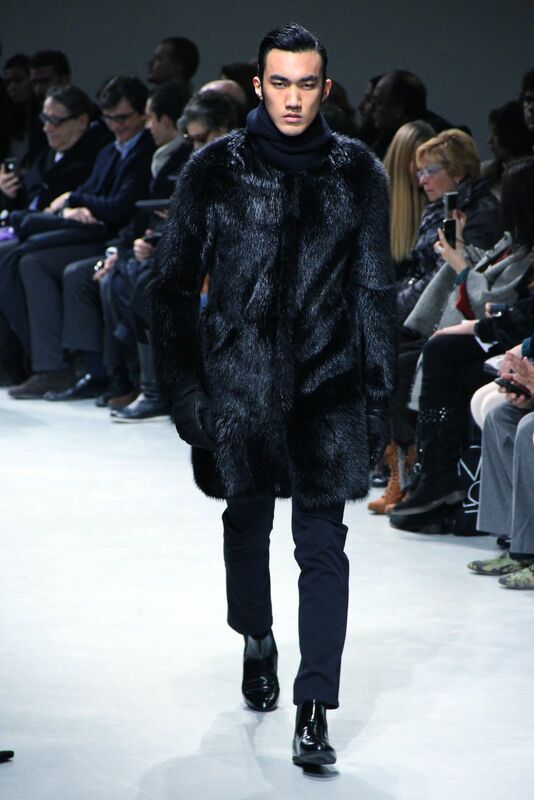 Similarly, the worn cotton parkas are doubled in Kalgan fur with argyle insets. The sporty jackets in Prince of Wales check or houndstooth with plunge nappa leather detailing trade off with double worked, woollen cloth tailored coats with visible selvedge. The military inspired woollen cloth outerwear is raw cut with patches and contrast stitching. Toying with mix and match, the loose, high collar shirts present unusual pairings of stripes and rhombuses, at times resembling jackets, but worked with knitting needles, or at others, appearing as cardigans with fur stitch collars. 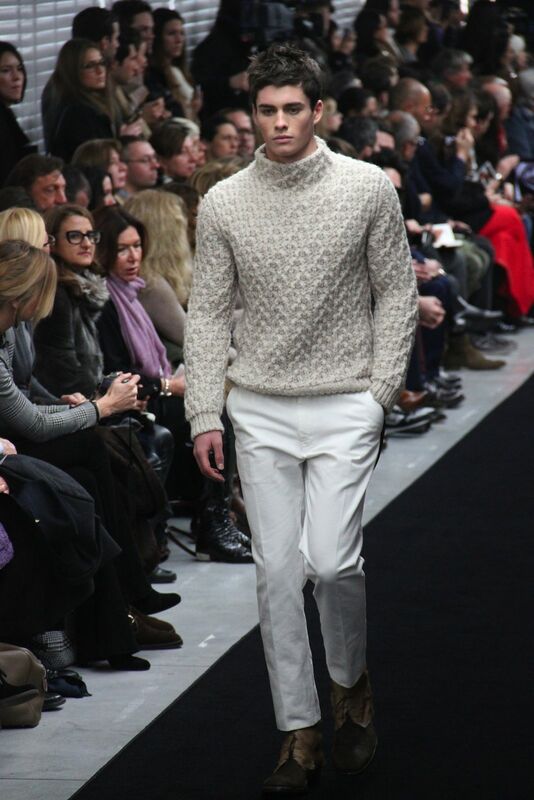 The white pant becomes the guiding line of next winter’s new look. Black for evening. 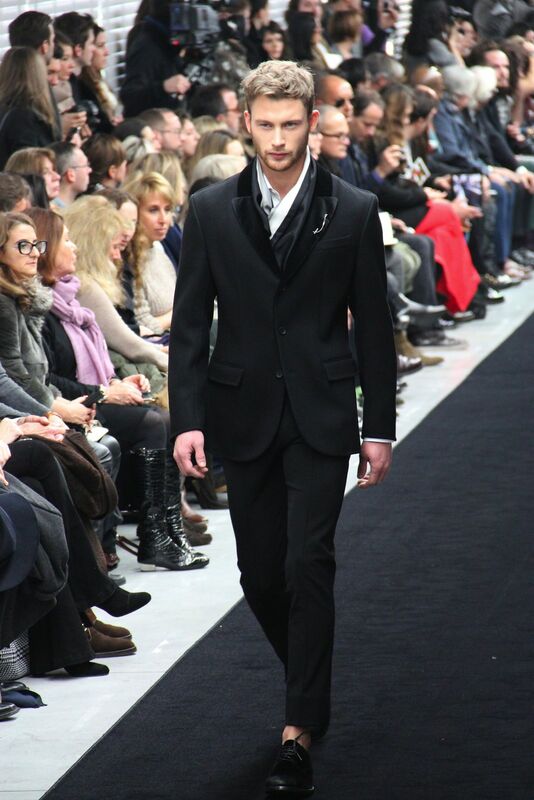 Double cloth coats and tuxedo jackets with plastron and lapels in velvet and satin. Jackets marry pilor with macramè yielding a worn effect as the result of being crafted by hand. The shirts are white with pleats and ribbing. 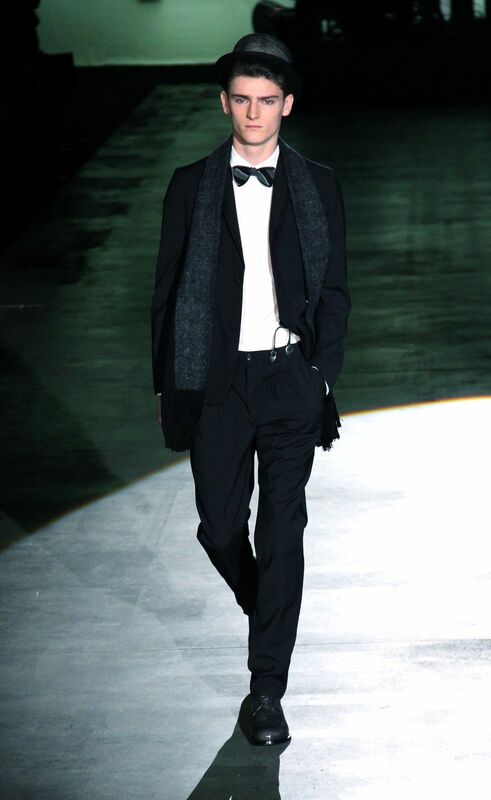 The silk scarf is black and white striped. 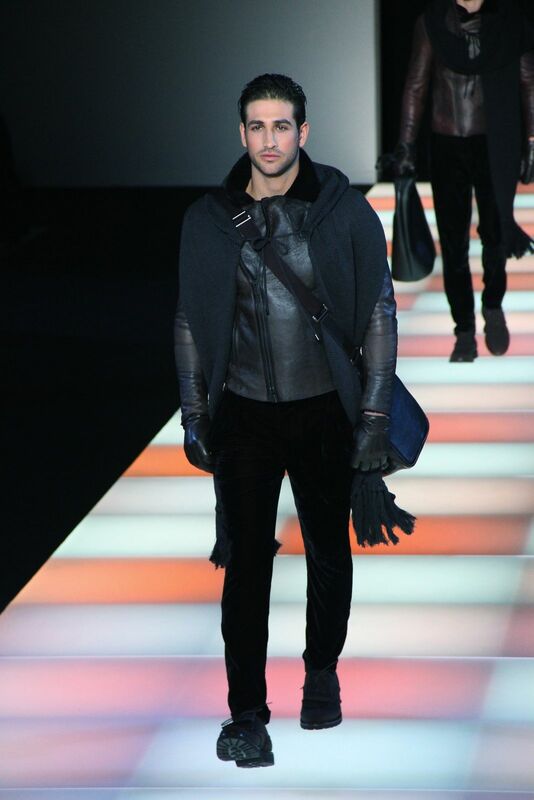 Accessories: scarves in special hides and velvet with an aged look, as well as new ankle boots in goat fur. 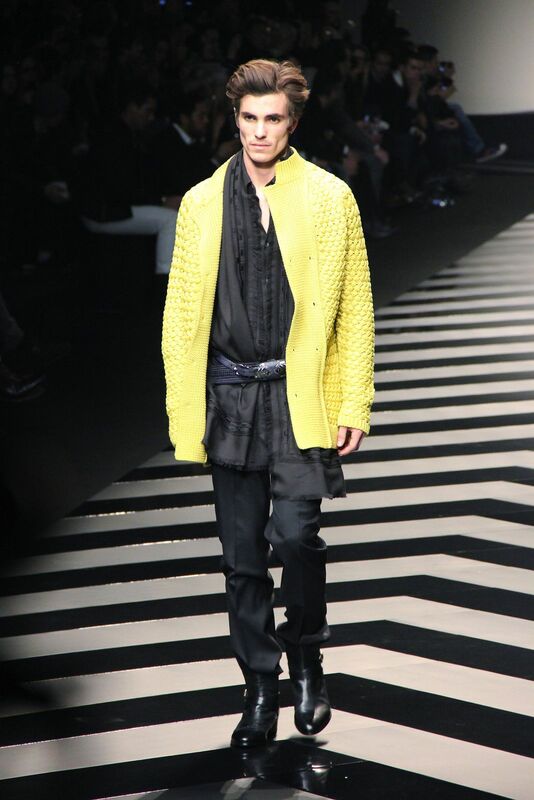 Scarves in the collection’s fabrics or in double suede with cashmere/silk knit. 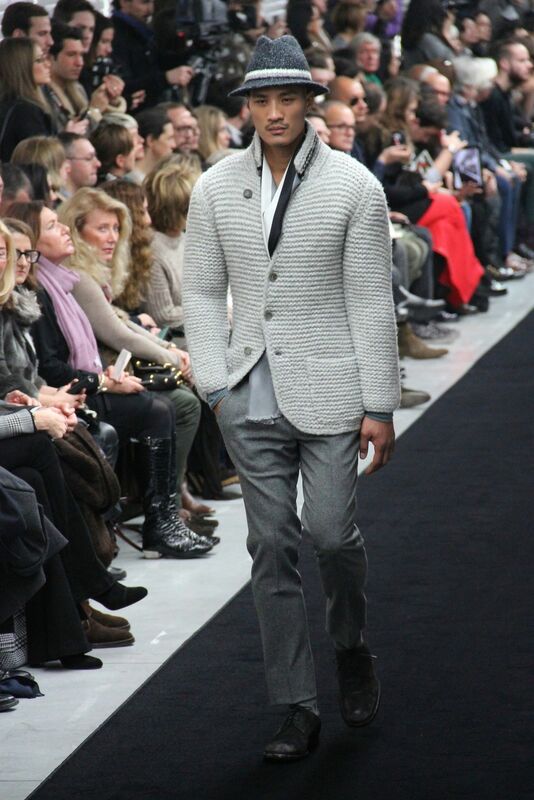 Colors: melange and anthracite greys, army green, shades of burnt brown, blues and blacks. Hints of light blue on the inside of the technical bomber jackets and the Oxford shirts. Points of red and yellow on the finishing of coats and shirts. Every journey begins a single step and in the quest for grand adventure and excellence, Bally’s Creative Directors Michael Herz and Graeme Fidler have created a men’s collection for Autumn/Winter 2012 imbued with the spirit of a life lived outdoors that is charged with exhilarating journeys and inspiring pursuits. In a collection dominated by technical detail, durable finishes and exceptional craftsmanship, it was never more certain that Bally owns winter: for the distinct and water repellant waxed suede and calf leather of the shoe collection; to the waterproof zippers and fold-over magnetic closure of the bags designed to protect from the elements; through to the highly technical detail of the outerwear distinguished by cleverly constructed pieces notable for their innovative use of leather and technical fabrics. Designed to protect the urban traveler from the elements, the outerwear includes impressive pieces such as a rich calf leather storm coat backed with Shetland wool twill. A subtle gold and silver leaf print dominates the garments and a special weather beaten effects completes the look that matches the worldly smarts of Bally’s trailblazing adventurer. 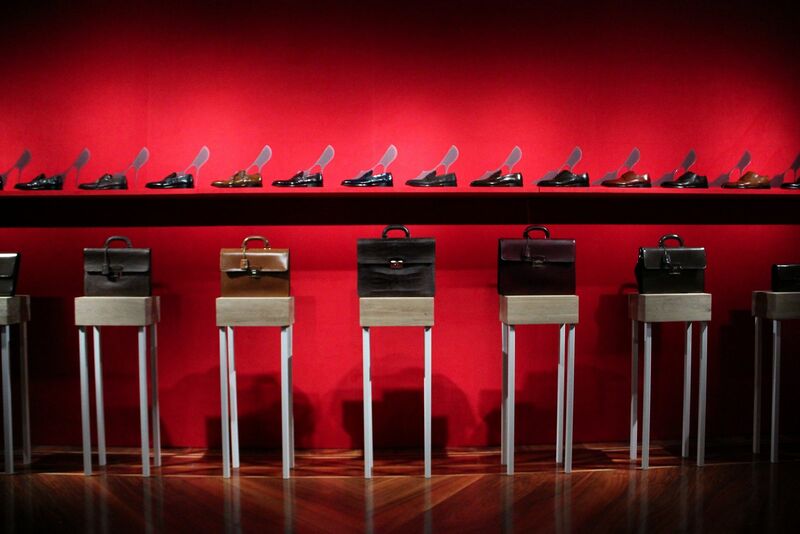 The shoe collection is founded on Bally’s signature Scribe with its renowned craftsmanship and Goodyear-welting. Blake construction has been introduced to a range of high quality dress office shoes for smart seasonal style. 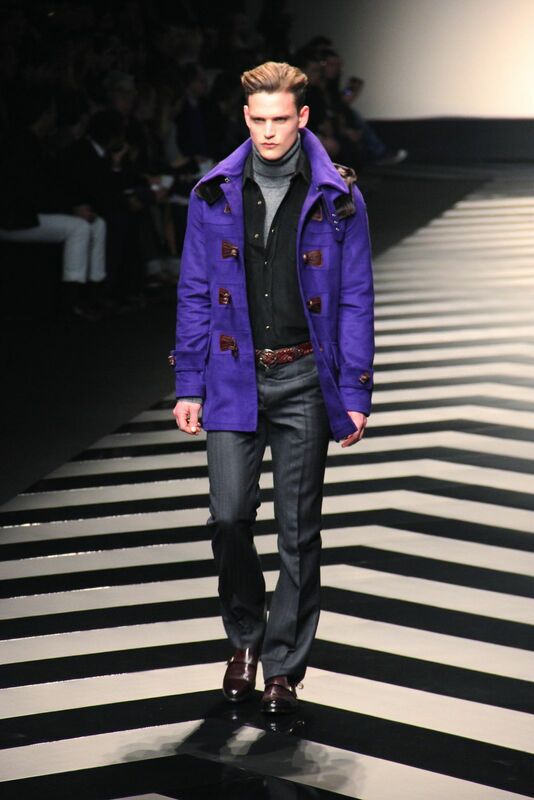 Bally has increased its focus on relaxed men’s moccasins and together with curling boot that was completely re-engineered for winter 2011, every man is covered no matter his walk of life. The theme of outdoor adventure continues with the men’s bags featuring highly robust luggage, messengers and crossbody bags all designed for extreme durability as our urban explorer moves through his daily life. 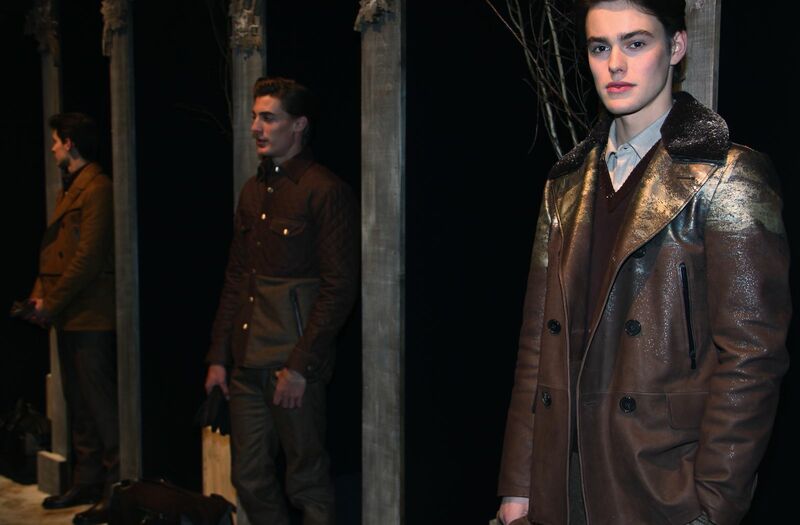 Each pieces of Bally’s Autumn/Winter 2012 men’s collection has been designed with exacting purpose and precisely constructed in the Swiss brand’s fine craftsmanship traditions, reflecting demanding adventures through the weathered Swiss alps whose raw beauty is spectacularly outlined by winter snow. Colours: black, chocolate, toffee, old silver, old gold and bronze.